Description: Date of photo approximate. Description: A westbound NS freight on the BNSF owned north track between WB Junction and Norborne. Description: NS Northbound Freight Train rumbles through Findlay, Ga. Description: Last train of the day, NS 6633 leads 38G east bound through Bridgeport. Description: A Horsehead Dash 9 leads an eastbound freight under the PRR style signals at Leetsdale. Description: It was getting dark as I took this shot, but it sure looks crowded in there! Description: The Norfolk Southern, ever promenant on the BNSF. Description: VSO1 designated units are assigned to the Shenandoah Yard. Title: Shenandoah Yard, along 1st. St. Description: NS 6704(38Q), NS 7615(V92) and NS 6633(VSO1) rest in the yard. V92 will soon depart back to Harrisonburg. Description: 19G heads west after having to protect a crossing just east of Alburtis. Description: 34A crosses the Rockville Bridge at 12:48PM on a cloudless October day in the Harrisburg area. Description: Another view of 34A crossing the Susquehanna River. Description: Trailing behind a GE unit as it departs Northtown Yard at University. 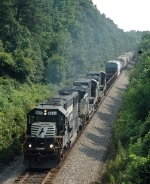 Description: A BNSF manifest. Most of the cars where BN grain cars. This was probably one of the greatest latch ups I've seen in awhile.